I love it when I discover new foods that are more than meets the eye. After passing by Rocio’s Saltenas & Pasteries for months on my commute to and from work, I finally decided to pop in. Initially I thought saltenas were just Bolivian empanadas, even though they get their name from an Argentinian city. Saltenas are dumpling shaped pastries that has a braided ridge on top and a savoury soupy stew like filling, similar to a pot pie but with a runnier gravy. As I began to research saltenas (thank you wikipedia and about.com) after my visit to Rocio’s, I actually think this Bolivian baked snack and Chinese xiao long bao (XLB) are related some how. The 2 food items have more in common than you would think. Here’s a rundown of their similarities. The liquid is achieved by adding gelatin to the savoury filling (peas, carrots, potatoes, herbs and meat) and then letting it chill for a few hours before it is encased in the pastry wrapper. In the oven, the gelatin melts and you get the liquid which makes saltenas different than empanadas and what made me think of XLBs. Much like the XLBs, you want to eat saltenas with care (practice makes perfect). I would recommend holding the saltena up right so you can start from one corner, ensuring you are sipping and slurping the soup until you eat your way to the other corner. Fortunately for me, I resisted the urge to eat the saltenas I picked up from Rocio’s while driving. I could imagine the mess I would have made in my car. Safely at home, with utensils and a plate, I tried the beef, chicken and vegetarian saltenas and enjoyed the savoury yet subtly sweet pastry snacks. The Saltenas at Rocios are not very big; they are about 4 inches by 2.5 inches by 2 inches. I definitely think you need 2 for a satisfying snack. 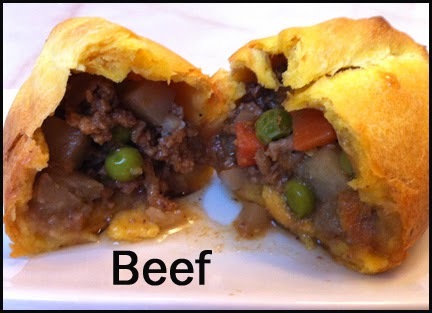 The beef (with a plain dull finish on the pastry) and chicken (with a shiny finish on the pastry) had identical fillings with the exception of the meat. The aromatic filling included carrots, peas, potatoes, onions and herbs. 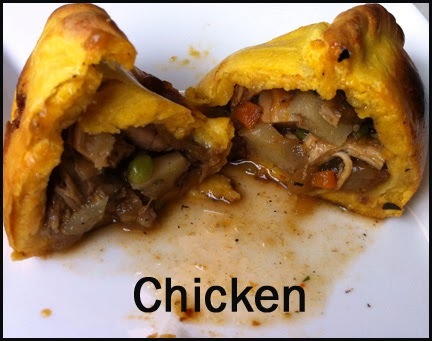 With the inclusion of the chunks of beef/white meat chicken and the soupy filling, it is very similar to eating a portable pot pie. The chicken version had more juice than the beef one. However unlike a pot pie, the saltena has a sweetness to it. It’s present but not overwhelming. I’m pretty sure it comes from the pastry wrapper and not the filling. The pastry that houses the filling has a slight crispiness to it but is not flaky. The vegetarian saltena (a speckled finish on the pastry) was a bit spicy. The ingredients of veggie filling was a little hard to figure out. There were definitely potatoes, peas, onions, carrots and parsley. I think there were chopped mushrooms as well and I was sure I ate one raisin (raisins are a traditional ingredient used in saltenas). 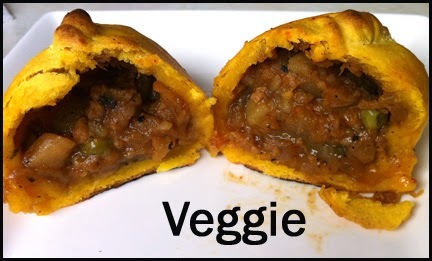 In addition, the vegetable filling was a drier than the meat versions. The veggie concoction was also sweeter and the spiciness helped add a contrasting flavour to the snack. Overall, I think all the pastries were seasoned well and I like that there’s a back and forth between savoury and sweet flavours. Personally, I think the beef one was my favourite saltena.